Live edge … furniture and finishes that include and exalt the contour of the living tree. Unlike squared-off edges, which permit only wood experts to decipher the original form--reading the grain and knowing where in the tree a particular slice grew--with live edge the layperson can know, and relate, and touch, and connect the material to the being it was part of. 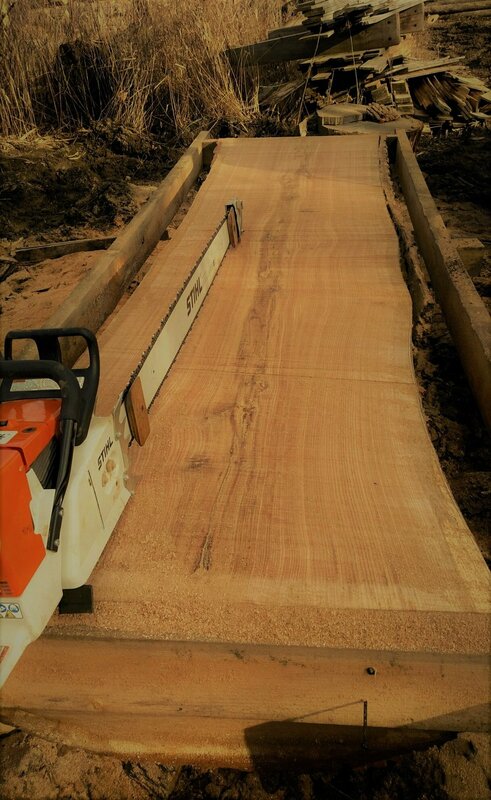 We see live edge (or natural edge) everywhere now and have for some time. So many home decor catalogs I receive in the mail offer at least one piece within their collection. We marvel a bit at the staying power of this seeming trend, wondering when it will taper off. The team at Urbn Timber, whose open house we attended last weekend and who specialize in live edge slabs and furniture, believe it’s actually just starting to really take off in popular home decor in our area. I wonder, are they right? Is this less a trend and more a furniture tradition that is just now reaching its height? A quick bit of online research reveals the origins of live edge use in furniture. George Nakashima, an American of Japanese ancestry, first used live edge in his designs right after World War II. His story is fascinating and inspiring, as he, along with so many other Japanese Americans, was confined to a concentration camp during the war. During that time, Nakashima studied with a master of Japanese joinery and hand tools also imprisoned there. He later used that knowledge in distinctive, award-winning designs that are still highly desired today. I mention his name to Dan, who immediately nods in recognition, and observes that he saw some Nakashima-inspired pieces just a couple weeks ago at the Columbus Woodworking Show, where we also first encountered Urbn Timber. Live edge is clearly a contemporary furniture tradition, rather than a passing trend. And still I wonder what is it that people so love about it that they are willing to spend $4000 on a custom built live edge table rather than an $800 squared-edge, mass-produced option. We believe that, while there is a time and a place for Ikea (such as in the bedroom of a rapidly growing 4-year-old boy), there’s also a time and a place for that one-of-a-kindness, no-you-can’t buy-this-because-it’s-the-only one-anywhere kind of awesomeness. We also believe there will always be special kind of customer who is looking for just that. Timber framing, a style and technique that, like live edge, has roots in the wood-working traditions of Japan, is a similar value proposition on a larger scale. We are encouraged by the popularity of live edge, and by the success of businesses like Urbn Timber, as it shows there is still a real desire for the things we’ve always valued at Ogonek Custom Hardwoods: sustainable materials, hand-craftsmanship, and an aesthetic of authenticity.